If Carlsberg did rugby tours, this would probably be the best rugby tour in the world! 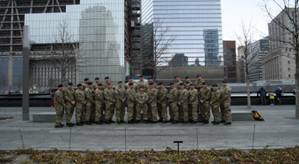 At 0415 hrs on the 09 March 2013 after eagerly awaiting this moment for many months, twenty-six members of the Redwings RFC made up of players from 33 and 101 Engr Regt (EOD) turned up at the Regimental parade square bright and early to leave for NYC. Albeit for a few stragglers claiming their alarms didn’t go off, we left Wimbish Station pretty much dead on time and made our way to London Heathrow for our Virgin Atlantic flight to John. F. Kennedy airport NYC. For most of it the journey was quiet, apart from a few of the usual loud ones, but you could just feel the excitement amongst everyone. All twenty-six men wearing the same Redwings tracksuit knowing that what we were about to do over the coming week was unheard of at Regimental sports level. After eight hours in the air, wheels touched down at JFK airport 1300 hrs local time and it didn’t take long for everyone to perk up; we were fast tracked through customs, luggage collected, boarded our coach and it was off to the hotel. By this time everybody was itching to drop kit off in the rooms, knowing that the next timing was Monday morning for training in Central park. Monday morning we all met in the hotel lobby and made the 5 minute walk into Central park to train. We found ourselves an area and with a few local spectators we started the session. 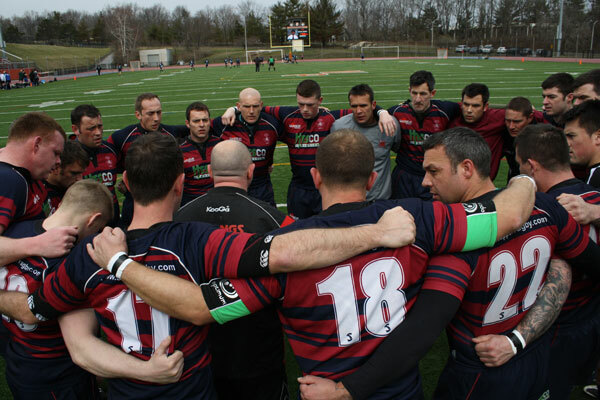 We trained hard, practised our game plans as forwards and backs, then as whole team. Finally we brought it all together at the end of the session and finished on a high, with the right mindset needed for the upcoming games. Tuesday morning the Redwings met in the lobby once again for another hard training session at Central park. In the afternoon, dressed in smart MTP uniform we were ready for our cultural visit to the NYPD Bomb squad at the 6th Precinct. We travelled via the subway which was a short ride downtown. We were greeted on arrival by members of the NYPD bomb squad who were extremely welcoming to us, as were the whole of the Bomb squad that were present. We had a great time exchanging war stories and looking around their facilities and through some of the kit they had available to them. At the end of the visit some of the lads had various bits of memorabilia to leave with. Wednesday was MATCHDAY! Our opposition was County Union RFC, we had an evening kick-off at the Tiger Stadium which was 45 minutes out of the city. It was clear that everybody in the squad had turned up fully prepared to win. We changed into our match strips and got out on the pitch for a warm up. The match started and it was a hard fought contest with some big hits and great plays. The game came down to the very last play when we were given a penalty 50m from the posts. Spr Mark Adamson stepped up and wanted to kick! With the pressure of the game on his shoulders he absolutely belted the ball straight as a dye through the middle of the posts to win the game 23-20. Needless to say we all went mental! Thursday morning saw a few sore heads, both from the game and after the hosting they put on for us post game. 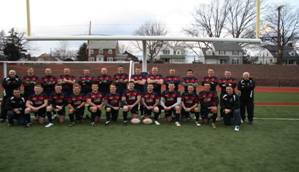 However today a group of the Redwings were heading a bit further upstate New York to put on some coaching and mentoring for some schools, this was to raise awareness and promote Rugby to children in America. The day was very successful and was received with great enthusiasm, and appreciation. Friday morning saw another good training session in preparation for our final game on the Saturday. After a day of rest the squad turned up looking sharp and mentally prepared for another game which was sure to be tough, drills were slick and confidence was high, the Redwings were definitely enjoying and relishing the experience of the tour. The afternoon was set out to be a great day visiting Ground Zero and then the Empire State building. Again dressed in immaculate uniform we headed out into New York and arrived at Ground Zero. It was an extremely humbling experience visiting a place where so many people had lost their lives and to see where the fuse was lit to initiate current military operations. We were met by many tourists who expressed their gratitude towards us and our comrades. Lots of children and families wanted to take photos with us, it was very heart warming to feel this appreciation from so many! We then moved onto our second visit of the day which was to the Empire State building, we were going to try and recreate the scene from the movie King Kong by sending SSgt Nathan Young to the top, but after exceeding the weight limit in the lift we had to abort. We all had a great time and its great to be able to say that we had the opportunity of visiting this famous landmark. Saturday was a big day, for two reasons. Firstly it was our final game against White Plains RFC and secondly it was the final of the Six Nations between England and Wales. We were all up early as our game had been brought forward so that we would be able to watch the second half of the Six Nations. Our final game was tough but it was a very tight fought contest, we had some great possession and made some great breaks. We battled all the way to the end when White Plains managed to sneak in a winning try. This game saw great desire and ambition from the squad with an outstanding performance from Spr Sean Cairns. The final score was 17-12 to White Plains. The tour was topped off for the entire Welsh minority of the squad in the bar as they watched Wales marginally beat England. Sunday was the day to pack and leave for England. It had been a great week with friendships and team camaraderie growing with each day. The experience of a tour this size at Regimental level will most likely never be seen again, but for everyone involved who had the opportunity to take part will remember it for years to come, and will always be grateful to every person involved in the organising of the event, but especially to Capt Andy Sanger MBE who put in huge amounts of effort and time to make it happen.